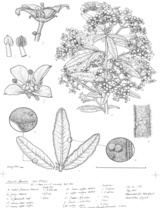 Zieria formosa J.D.Briggs & J.A.Armstr. Description: Rounded shrub to 1.5 m high and 1 m diam. ; branches warted, stellate-pubescent; older branches less warted and glabrescent. Leaves with central leaflet lanceolate, 15–30 mm long, 3–5 mm wide, apex ± obtuse, margins ± toothed, strongly recurved; upper surface warted, stellate-pubescent, light green; lower surface sparsely warted, stellate-velvety, paler; petiole 2–4 mm long. Inflorescences slightly longer than leaves, many-flowered; bracts persistent, 1.5–6 mm long. Calyx lobes triangular, 1.5–2 mm long, hairy. Petals 3.5–4 mm long, valvate, pale pink to ± white, outer surface stellate-pubescent, inner surface ± glabrous. Cocci warted, glabrous or sparsely stellate-hairy, lacking an appendage. Distribution and occurrence: Grows in heath on a rocky outcrop near Pambula.